Well, Bugs is 8 years old, and last summer he did a fantastic job of tending the garden. We told him he could get a pet of his own to care for. Originally, we were thinking a fish, but then you have to deal with water changes and potentially stinky water dripping on the carpet (we had enough of that when I had my frogs on carpet!) We decided to get him a leopard gecko, as they are easy to care for, hardy, and companionable (and I already know about them). Then came the weeks of watching for a leopard gecko in need of a home. Sure, we could have gotten one from a pet store, but we prefer to rescue our pets (plus there was a chance that some of the taming process would already be done, as well as the growth process. Oh, and they’re cheaper). A couple geckos showed up on Craigslist, but we required Bugs to research the needs of his gecko before he could get one, and he became overwhelmed and quit (Ninja, meanwhile, did the required research work, coming up with what questions they needed to answer). So that opportunity passed us by, but that was ok. When another couple geckos showed up on Craigslist needing a home, Bugs quickly did his required research and proudly displayed his typed-up care sheet. We went that evening (St. Patrick’s Day) to look at the geckos, and ended up getting both- one for Bugs and one for Ninja. Now, I’ve taken care of an adult leopard gecko before, but never a juvenile. I knew enough to look for alertness and activity and how well they adjusted to handling. I knew they were skinny, but chalked it up to them being juveniles. The owners told us they were feeding them super worms and we were skeptical, but bought them anyway. They are HUGE compared to the lizards! Well, Ninja and Bugs were ecstatic about their lizards and we had to teach them not to drop them and how to hold them and all that handling stuff. Don’t put them on the couch. Don’t leave him on the table. Let him rest. He needs to warm up. Etc. Overall though, the boys did well. We tried feeding them, but they were not interested. Both were alert and seemed ok with the handling, although Ninja’s was calmer than Bugs’s and seemed tamer. They chose gnarly colored calcium-sand for the bottom (not too worried about importation as we are feeding them in a separate container) and chose rocks for decoration and hide places. Bugs and Ninja were both excited to spend their own money on extras for their lizards. About 5 pm Saturday (we’d had them for 24 hours), Ninja’s gecko took a turn for the worse. He lay there in his cage, too tired to get comfortable. We tried to help him out, but when he didn’t perk up, Ninja and I whisked him to the vet. Two reptile vets came in to see him on a Saturday night (I love my vets!) and told us he was emaciated and gave us a syringe and a liquid diet. We force fed the little guy there in the clinic and then whisked him home to get under the heat lamp again. Then at home, I force fed Bugs’ gecko, flashing back to feeding my iguana Kala with a syringe shortly before she died. Not long afterwards, I checked in on them, and Ninja’s gecko was dead. Crushed, Ninja asked to have a funeral for Green Ninja/White Tail/Dan/Ninja (he went through several names), so we buried him by a stump and Ninja said a few words “I loved you, Ninja.” Then we gave him lots of hugs and snuggles. Ninja says he doesn’t want to give up, so we promised him we’ll look for another gecko for him. Meanwhile, we’ve got appropriate sized food for Bugs’s gecko and are force feeding him daily until we can get him to eat. He’s nice and feisty, so hopefully he will rally. When getting the boys a pet of their own, we knew this was a possible outcome. At least it wasn’t (mainly) the fault of either boy. The previous owners thought they were eating, but they’d been just putting the worms in the tank and assuming they ate, whereas we are feeding them in a separate container to monitor their feeding. The little lizards have already taught them so much- basic research, reading skills, review of reptiles and exothermic/endothermic differences, care taking, respect, etc. Now, Bugs and Rocky are learning how to comfort their brother as he grieves. Not that they haven’t already been through enough death! It’s been really nice to see, though, how the boys have taken to heart their responsibility. “It’s your responsibility to keep them safe so they don’t get hurt,” I told them, and their handling skills dramatically improved. “Your lizard depends on you to give him everything he needs,” I told them, and they couldn’t wait to feed them- we offered food four times that first day, and they initiated it. Bugs has changed the water multiple times a day on his own initiative, whenever it gets sandy. So we’ll see what happens- hopefully Bugs’s gecko recovers! What Does Homeschooling Look Like? The short answer is, it depends! It depends on the day, on the family, on the circumstances. For us, oftentimes we are found in the study room working at some academic purpose for a little bit during the day, and the rest of the day we are scattered through the house pursuing our interests. That means Ninja is often playing Minecraft or Legos, Bugs is usually either in his room watching physics and astronomy videos or playing Minecraft with Ninja (Bugs recently decided on his own to make his Legos communal Legos- amazing personal growth! ), and Rocky is usually drawing or playing pretend. Today, Rocky was up last night coughing, which means I’m exhausted, and Bugs is also not feeling good- he’s throwing up today. So rather than formal study time, we are taking care of ourselves. That doesn’t mean the learning stops. Here’s what homeschool looks like today for our family, right now. That’s Ninja with his bear, cereal (which he’s been getting himself lately), and water absorbed in a Lego story. Rocky is drawing on his little notepad. Bugs is laying on the couch watching TWIT. And the empty space is where I was (before hopping to take the picture), taking an online Montessori homeschool training offered by Marnie Craycroft. My Ninja had a sequence of terrible ear infections when he was little, culminating in surgery to insert tubes. This is not uncommon, but he also had trouble producing proper sounds, and I am pretty sure the ear infections are related to this trouble. So we monitored, and I got out my speech language pathology stuff from college and tested him and talked to SPLs I know. They were pretty sure he would grow out of it, but I was not so convinced. So we began practicing about a year and a half ago. We’d say every word we could think of that started with troublesome phonics- sounds like f and s and t and p and b and d and g and k. We’d target a particular issue of his and practice with words, finding those sounds all over in life. We did a lot of various speech work including minimal pairs and sound productions and producing the target sounds at the beginning, middle, and ends of words. Ninja is a perfectionist. This sort of thing irritated him greatly. However, when we’d occasionally have cupcake and cookie parties (he’d get cupcakes as long as he could say the word properly), and that would get him excited about working it again. The thing is, I quickly realized that this sort of thing was actually preparing him for reading. And he’s been able to read very simple (cat, dog, etc) words since age 4, except for forgetting occasional phonics. He just hasn’t believed he can, and therefore hasn’t been motivated. In one month, my little Ninja turns 6. Lately, I’ve been thrilled about his increasing interest in academics, and yesterday we had a wonderful phonics lesson! Montessori puts great emphasis on preparation, and reading instruction is no different. Before the child reads, they learn that words are made up of various sounds. We play I spy quite frequently when we are in the car to develop this ability, and lately Rocky (always game to try to keep up with his brothers) has actually begun to figure out the game! Ninja excels at beginning sounds, but has more difficulty thinking of words with the target sound in the middle or at the end. This is a skill we continue to work on, while including beginning sounds to keep the fun up. When we’re home, we tend to play I spy with his box of miniatures, which he loves. He loves to try to trip me up by getting technical (for instance, he might have spied the green snake with red squiggles, so the yellow snake is not a winning guess). Less often we play games with hiding items and finding them based on sound, or by hiding the letters and retrieving them by sound in a desired order. Yesterday, we played two games that Ninja was ready for and thoroughly enjoyed. He labelled items in the room with letters standing for sounds in the word. As usual, initial sounds were much easier than medial or ending sounds. Then, I re-introduced him to Pick Up Sticks. I used a pack of colored popsicle sticks that I had gotten cheap from a craft store and labeled with one letter per stick. Just like Pick Up Sticks, we dropped the whole lot of them onto the floor, and then began picking them up. The rule was that you could pick up as many as you wanted, one at a time, until you moved another stick (not the one you were picking up). Ninja was impressive, gathering quite a pile of letters before he accidentally bumped a different letter. Bugs wanted to play afterwards, and Ninja was far better than either Bugs or I was at precision of movement. Now, the next rule of the game addressed the phonics. Ninja could take another turn of picking up sticks if he could use the letters he’d already grabbed to spell a word that he could appropriately say. It didn’t have to be spelled properly, nor did it have to be an actual word, but he needed to use English phonetics to read his “words”. Well, at first he lost his extra turns because he kept wanting to make super long words that were too complex for him to read. His first word that got him an extra turn was “ap”. He also worked hard to spell “aqua”. No dogs or cats or foxes, even though he had the phonics for those words. It was also funny to watch him, because he sounded out his word-in-progress silently to himself. How did I get two perfectionists? Ninja has always been that way with words- he barely babbled and instead was quiet until he could say intelligible words (aside from the speech malfunctions). When it came time for my turns and I would inevitably mess up, the rule was that I would spell a word (I kept to CVC words for him) and if he could read it before I did, he would take his next turn- otherwise I got an extra turn. This really helped him increase his confidence, as he realized that he really could read words fairly quickly. It was delightful to see. So my Ninja is really coming along, pulling everything together. For some reason it’s easier to be patient with his reading progress than it is with my Bugs. With Bugs, I still find myself prone to fretting, even though his reading is also coming along- he’s reading more and more fluently every day and large words like “sometimes” don’t trip him up anymore. I think Bug’s progress might actually have less to do with reading practice during study time and more to do with his tradition with Daddy of reading a chapter of Harry Potter before bed each night. Bugs reads the chapter title, and Daddy reads everything else, but Daddy catches him often sounding out words ahead of him and sometimes reading along. With all of this, Rocky is hanging out, watching or playing along or listening while working on his own things (he’s loving the pink tower still). I have faith he’s taking in these lessons as well and when it comes time for reading to click for him, just like with Ninja and Bugs, that it will click and he’ll be off and reading. I’m so excited because I feel like Ninja will be reading simple books this year and I think Bugs will be reading independently this year. Once that happens, a whole new world of exciting possibilities will open up! I went through their 3 year work plans yesterday too, checking off what they’ve begun, dived into, and mastered, and it’s amazing to see all those little check marks! Ninja’s is for ages 3-6, though I just printed it off for him at the beginning of the school year and there’s some overlap with the age 6-9 one Bugs is working off of. Bugs is nearly completed, except for his reading section, which I’m holding back on check marks until his speed and confidence increases. Ninja’s is over half done, and most of what is left are things he will continue in his 6-9 list. I love seeing the progress in an overall fashion, as well as what they need to focus on to avoid gaps in their education. I have a tendency to mistrust our chosen learning process sometimes, simply because it’s so hard to demonstrate progress and so different than traditional schooling. However, one of the main reasons we educate the way we do is because it is so different than traditional schooling. Still, I fret. And then other times, I have days like today, where really a ton of learning went on (yes, it’s Saturday. Yes, you can learn things on Saturdays). We decided we needed to put our collective parental foot down on the boys’ media usage because Bugs has been a little too into it especially. Basically, that’s all he wanted to do. No projects, plus he was quickly becoming frustrated with learning things. Bad news. Once I figured out what was bugging me (his media usage interfering with his learning) it was time to intervene. We don’t intervene often, because we prize their freedom. But just as we can’t let them eat potato chips and only potato chips, we can’t let them consume only junk media. Mostly they are eating well (and consuming media at a reasonable rate), but sometimes the pull is too much. Then we step in. Anyway, we forced them to go outside to enjoy the beautiful mid-50 degree weather (gasp!) and play. Daddy and I took the opportunity to do some chores- Daddy put the swings back up, picked up some fallen sticks, and partially cleaned out the shed, and I planted some daffodils and removed the old straw bale that was still in front of the house from fall. Yuck. We decided to burn it, and while it burned, so much learning took place. It was amazing- everything I love about homeschooling. Rocky spent the vast majority of his time swinging or playing in the sandbox. Ninja complained for a while (he is really an indoors kind of kid) and then got into swinging and practicing riding his bike. Bugs had an attitude. However, once he got into swinging, he came around and helped me keep an eye on the fire (sometimes a little too much). And we talked- boy, can Bugs talk! But it reminded me how much he learns simply through conversation. He learns so much through conversing about the subject- a lot more than I would have expected at the start of this journey. Bugs typically discovers a subject through the Great Lessons or books or Kids YouTube, and then asks questions, and then we encourage him down various routes for more depth. For instance, today we discussed the differences between mice and bats (we saw a mouse and we checked our bat-houses), how bats migrate, fly, and hibernate, making them very special, what three things are essential for a fire, fire safety, black holes (his current obsession), why spinach gets smaller when you cook it (cell walls and water loss), the difference between plant cells and animal cells, and more I’m sure I’m forgetting. Tomorrow, he’ll likely explore one of these topics in more depth. Yeah, tomorrow’s Sunday, but you can learn on Sundays, too! Ninja learned that complaining is not beneficial 🙂 and also learned physical movement skills, which are important. That swinging and bike riding will pay off for him later on. For Christmas this year, we were the astonished recipients of a 3-D printer. Yeah- totally unexpected! Needless to say, we quickly put it to work making all sorts of things, among them several Montessori style materials that we had thus far done without. We’ve made a brown stair (my husband misunderstood my instructions and made them with only one dimension changing, rather than one dimension static, but that’s ok- I like them this way). We’ve made a pink tower- this is something we’ve done without for so long even though it’s an iconic material, and I was worried that we didn’t really need it, but when it’s so cheap to make (excepting time), my husband happily set the parameters and got the printer printing. We’ve made several materials for the boys’ phonics miniatures basket- the fox, igloo, octopus, tentacles, and rat come to mind. We’ve made skittles for division practice, rather than making do with blocks. Oh, and also containers to hold the skittles and the color palette the boys have all grown up using. We’ve also made a set of 9 thousand cubes of fitting dimensions to the ETA materials we had been given, which rounded out our Golden Bead materials (which are neither Golden nor Beads, but fit well enough for our purposes). Mostly, I make the materials, printing and cutting and laminating and cutting again. We store them in bags that I make or in plastic bags or in clear boxes I find for cheap, because we aren’t looking to spend multiple thousands of dollars on official Montessori materials. Instead, we buy what we can’t make and do without those things we consider nonessential. Therefore, we have a binomial cube we purchased, animal/continent cards I made, and we simply don’t have those nifty beads with 1, 2, 3, 4, etc on a wire for counting purposes. We use blocks instead, even though they aren’t connected- you can still see the effect of adding one clearly. I have to chuckle to myself because Montessori designed her method to use for poor children, yet now Montessori schools are so expensive you can’t get in if you’re poor (without help). 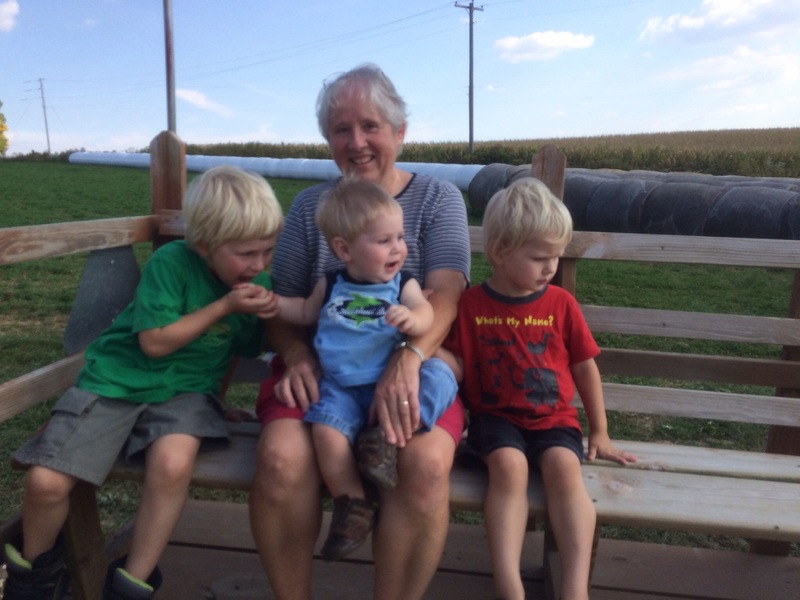 We decided not to send our kids to Montessori school because of the cost. But that’s the thing. The materials are amazing, and yes, it is important they be well made and beautiful. That’s part of the magic of it. But the philosophy, the child-led learning, the purposefulness, the self-correcting materials, and the peace: these are all more important than making sure you have all the materials (and the space to put them all!). So can you do Montessori on a budget? Absolutely! Can you do it in limited space? Yes! You just won’t be emulating a Montessori classroom, and that’s ok. Homeschooling does not have to emulate any classroom. That’s one of the beauties of it. I’ll leave you with some cute pictures from today’s study time, mostly because I can’t resist. Rocky working with his pink tower (which he loves, despite my fears he wouldn’t like it! Incidentally, he didn’t touch it until I painted it pink, and since then he’s taken it out to work with multiple times on his own, putting it carefully away each time). Ninja working with addition with our “Golden Bead” materials. He learned today about dynamic addition. It warms my heart to see my kids loving learning so much, even when they’re sick! I love the Montessori approach to math. That and the peace education are easily my favorite aspects of Montessori philosophy. I’ve been reading John Holt lately, and it’s really impressed on me that understanding is far better than speed. I need to work on my own inner peace, on not being so anxious that my kids might not “keep up with their peers” (GASP!). What does that mean anyway? Who’s counting? Well, the school district is, and those who oppose homeschooling. So there is a pressure there, but it doesn’t belong on my kids’ shoulders. After all, one of our reasons to homeschool was less stress and less competition. Me working myself up about what the critics might say really does no good, especially if it leads me to put that stress on my kids. Yes, they need to learn, but they also need some leeway to do so at their own pace. Ninja has been anti-math for a while now. He has refused to do anything with the math bookcase, and will completely shut down if he thinks I’m putting pressure on him. Crossed arms, closed eyes, and turned away head- the whole shebang. And if I continue to “coerce him” (to his mind- often to my mind I’m just reasoning with him), well, then it’s time to go full fetal position on the floor. Ninja has the advantage that I’ve been concerned with Bug’s reading and thus distracted from pushing my concern on him. He has the disadvantage that Bugs picked up maths like he picked up breathing. (He still does. It’s crazy, and I don’t understand it, but I love it.) Ninja has not been this way. Until lately. You know how unschooling and Montessori philosophies both say that the child will enter sensitive periods and just pick up the knowledge they need to know when they need to know it? How they both say not to pressure your kid, but just present the information when the child is looking for it? (This is the hardest part for me). You know how, if you’re like me, you nod along with that but secretly wonder if you can really trust the process? Well, Ninja’s proving them right. He’s recently begun to grudgingly watch presentations on math. I’ve gone slow and not pushed him, and today, his apathy switched to interest. Today was his second lesson on the base ten system, and he was ecstatic, which made me ecstatic. Nothing is better than seeing the light go on and witnessing the pride a kid has when they have figured something out and mastered a new skill. Yes, I said mastered. Ninja went from not understanding the base ten system at all to working with the base ten system with skill and confidence in two lessons. He can now quickly and accurately make numbers up to 2999 using his manipulatives AND confidently determine which number was larger from two choices without using materials. In two lessons. Only two. (Why 2999, you ask? Because so far we only have 2 thousand cubes, so I did not ask him to go beyond 2999 because I didn’t want to push him into more abstraction than he could handle yet). Next to Ninja and me, Rocky was working happily on counting up to 5 and identifying the corresponding numeral, as well as tracing all of his numbers 0-9. Bugs was waiting with some impatience for his reading lesson. Impatience. For reading. Bugs. Yeah, today was a good day. Speaking of Bugs and reading, we’ve decided to switch from PBG to the Dwyer method. I think Bugs has been trying to memorize separately each digraph for each sound. Since there are so many different combinations, it can get pretty complicated when you aren’t seeing the overall logic of the system (yes, there is a logic to the English language; it’s just often obscure because no one teaches it!). The Dwyer method pretty clearly lays out the structure and gives the kids the tools to figure out the patterns- at least it seemed that way to me! It also is compact and can be super cheap (although my PBG stuff was also pretty cheap). I showed Bugs how to use his brand new Dwyer box, and he seemed pretty excited working with it. He hasn’t seen the patterns yet, but he loved that each envelope focused on one particular sound, and he enjoyed seeing the different ways that sound could be written, all laid out together for him rather than broken up and disconnected. I’m hoping this will help his fluency, as he is about a year and a half behind his public school peers right now in fluency. Montessori people have told me not to worry, that it will come, but that’s easy to say and hard to do! Dwyer proponents say that the kids can go from no reading ability to chapter books in a matter of weeks once they are ready, and I’m hoping I’ll see that soon with him. After all, Ninja showed me he could make similar leaps ahead with maths! The main thing was seeing Bugs’s and Ninja’s enthusiasm for working with the materials and therefore, their enthusiasm for learning the subjects! Ninja loved playing his phonics I spy games, which is setting him up really well for reading once it all clicks in his head. He knows all his phonics, and I have faith that once he’s ready, he’ll just take off (he does rattle off random words in the environment or in Bugs’s books, when he’s in the right mood). I’ll just need to remember these lessons of patience and faith while escorting Rocky down the paths of learning, too! It’s been so long since last I posted, and so much has changed! We are still homeschooling, and still loving our Montessori-inspired approach. We’ve moved, so we have a dedicated study room now, but the kids can still be found studying various things all over the house- especially Bugs. Bugs is eight now, and loves science, especially space. He loves learning about black holes and meteors and galaxies. He also loves lasers, building things, and working with tools (he has his own set of real tools like hammers and screwdrivers). I can usually find him either building something in his room with his Legos, playing Minecraft, or watching videos (usually educational) on his iPad. Smiley is being renamed (for the purposes of this blog) Ninja, which much better suits him. He loves stories- he’s my little story guy. He also enjoys Legos and gymnastics, which he’s really been working hard at! He’s five and a half now- time goes by so fast! Ninja recently lost his first tooth! He was a little nervous, but Bugs gave him a pep talk. Nothing warms a mama’s heart more than siblings spontaneously being kind to one another! Rocky is three now, and he loves to learn. 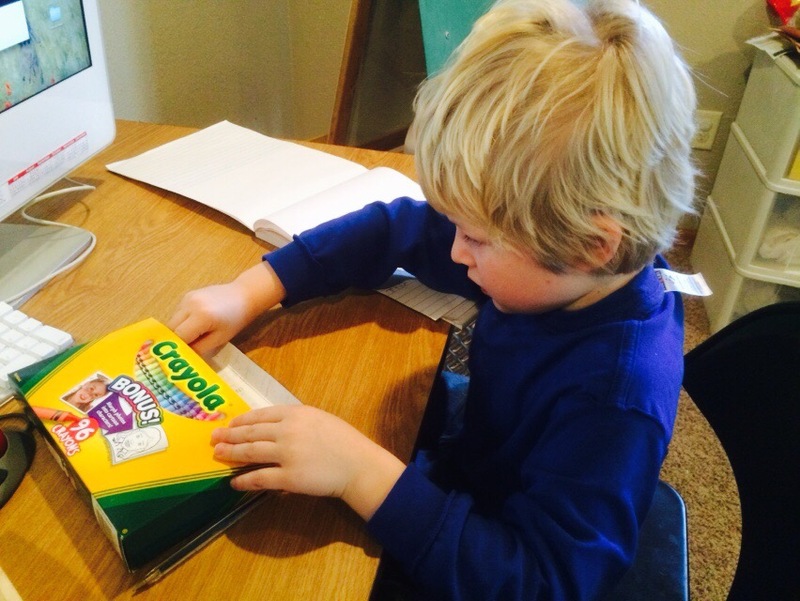 He loves playing with his study materials, and is often found throughout the day working with them. He also enjoys hanging out with his brothers and annoying them. I’m struggling to give him as much attention as he needs, but that’s my own time management, and we’ll figure it out. Even without all the hands on help he wants from me, he has learned nearly all his numbers from 1 through 10 (recognition), and several of his letters (sounds and some letter names). Today, I played a game with him on recognizing letter sounds, and he did fantastic, quickly being able to bring me what I asked for, although not yet able to tell me unprompted what sound the letters made. He’ll get there. After all, he’s only three! This week has been a whirlwind for me of watching various sessions from the Trillium Montessori Summit, which has been amazing! It’s been great to remind me of lessons I’ve already learned, show me how much I already know, and to teach me so much that was new. Two things I am practicing today: First, being fully present with my kids during learning times (hard with Rocky since he loves studying throughout the day, but I’m trying to ask him to wait while I finish something, and then give him my full attention. So far it’s been working!) and second, to stop doing so much for them. I am reminding myself that I already learned that second lesson. Really, to do tasks for our children that they already are able to do is to rob them of valuable learning opportunities. It’s disrespectful to them. We do it out of the kindness and goodness of our hearts (or simply the efficiency…) but the detriments are still there, despite our intentions! By asking my children to sort through and put away their own clothes, not only do I set myself up for less chores on my shoulders in the future, but I teach them to care for themselves. Today, they surprised me with the kindness of their little souls, volunteering to sort out each other’s clothes as well. It teaches them how to tackle big, seemingly insurmountable tasks. It teaches them responsibility and follow through. It teaches them independence. Can I rob them of these lessons for “kindness, goodness, and efficiency?” No! And yes, I know full well I will be re-learning this lesson later on! We are, after all, only human! One of the things I love best about homeschooling, besides the flexibility, the time spent with my kids (even when they drive me batty! ), and the fact that I get to avoid bureaucracy, is cultivating the sense that learning is everywhere for my kids. Today was a snow day since we had a large winter storm blow in over the weekend. After playing in the snow (and another failed sledding attempt), we came in and Bugs learned some cooking safety and self control while helping to make hot chocolate. After we finished our hot chocolate, we hung out in our den, where we like to spend a lot of our time. Bugs was playing his Human Body app, so we started. Talking about what he was seeing there, and he spent quite a lot of time playing with the nervous system. He also gleefully told me all about the digestive system, and we touched on the circulatory system. While he isn’t yet what we’d call a self starter he has glimmers. He enjoys playing with his Khan Academy app at bedtime before Lights Out, and seems to really like watching Sal’s videos. They stick, too! I have to read him the math questions because his reading comprehension isn’t there yet, but he has a pretty solid hold over finding areas of shapes now. He had a questions where he had to find the largest area given lengths and widths for three different rectangles, and that was easy because the largest had the largest length AND width. When he had to tell how much bigger the largest was than the smallest, after reminding him how to find the area, he did so for the biggest, and then took away manipulatives to make the smallest. Then, instead of counting the smallest (like I was expecting him to), he just counted what he had taken away to find the different. For a six year old, that’s pretty good. We’ve had so many fantastic conversations, from gravity and centrifugal effect with regard to the orbits of planets, to discovering how lift can counteract gravity by using paper planes. He even experimented with different wing lengths to observe how that affected lift. I just want to keep this wonder and curiosity and love of learning! We were in line to get ice cream just yesterday, and the boys were interacting with a lady behind us, who as it turned out was a teacher. Bug makes “spiders” with his hands, using his pointer finger as a head and the rest of his hand all crumpled up as the rest of the spider, and he was showing this to the lady. She very nicely asked for some personal space in a way I will likely emulate to remind him of this social rule in the future. Then it went downhill, as she learned that he was showing her “spiders” and decided it was a good idea to argue with him about the “proper” way to make spiders! They’re finger spiders! Needless to say, Bug wasn’t backing down. Times like that make me thankful for our homeschool group, where Bug is accepted for all his many quirks by the other kids. He knows he’s a little different, but he isn’t bullied or shunned (unless he’s obnoxious, and then the shunning is short lived). I’m grateful that he has the time to learn the self control and social rules he will need to fit in to the community at large, but also time to build up his self confidence and his defenses so he doesn’t need to worry too much about what others think. He may not be homeschooled through high school- who knows?- but regardless, I just hope that the skills we work on now will grow and make him stronger so that when he encounters the cruelty people often think of when they think of kids he can emerge relatively unscathed. And for now, when he occasionally gets that hint from kids he interacts with while out and about, at least he has many friendly kids at homeschool group he can fall back on to reassure him that he still a pretty cool person to be around. Smiley has been struggling with patterns for a while. Today it clicked, and he was so proud of himself! Meanwhile, Bug is writing voluntarily and independently more and more! Hooray! We’re still here, still learning! My goodness time flies! We’ve been crazy busy, swinging, climbing, running, catching toads and letting them go, and playing with friends. We raised all our tadpoles through metamorphosis and released them back into the wild where we caught them. We’ve been learning about the weather and tracking general trends and learning about the calendar by crossing days off as they go by. We now have a caterpillar that happened to cocoon itself the day after we caught it, so we are waiting for it to emerge. We tried to identify it by its morphology and we think we know what it is. If we’re right, it should emerge as a moth tomorrow! Bugsy is beginning to spontaneously read words written in his environment- on signs, on benches, etc. He also is getting very good as reading books and likes to stay up late to look at books. He has learned to climb our climbing rope too, which is a big accomplishment for him. 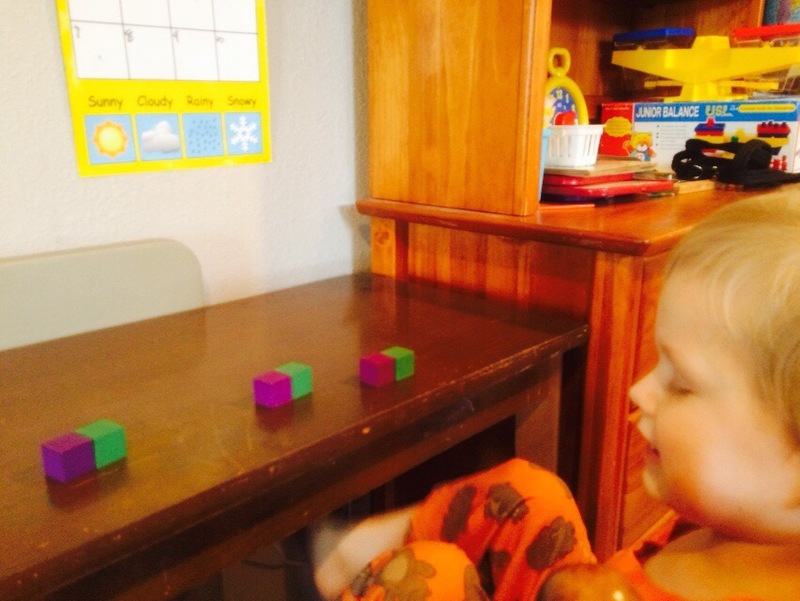 Smiley is learning simple addition like 3 + 1 and is counting reliably at least up to four now. He’s been very interested in phonics and so I’ve introduced him to A and E so far (phonics only, not letter names). He gets so excited when he sees letters in his environment that he knows! Rocky is running and loves to swing in his swing. Rocky loves to be read to and will bring over books to be read. We have to be careful though or he will also eat them! He loves to draw and play and wrestle with his brothers too!